Monday has returned once again. Has the blues set in yet? Monday we hate you. No wait. Don't hate it. That's because that's when I post my comics. Look forward to Mondays instead. I don't really enjoy taking public transportation. There are many reasons other than the main fact that public transportation in Malaysia is the equivalent to a toilet. I have no problems with the public transportation in other countries and I could take them with ease but I tend to to shy away from my own country's grand transportation system to avoid inflicting unnecessary mental and emotional damage to myself. I would rather drive or maybe hitch a ride from one of the bros.
No wonder traffic in Malaysia is horrendous. But every once in awhile, I want to feel different and I would just get on a public bus to get around. However, this one occasion was one of the reasons why I never take the bus anymore. Yes. It is an extremely superficial and stupid reason. 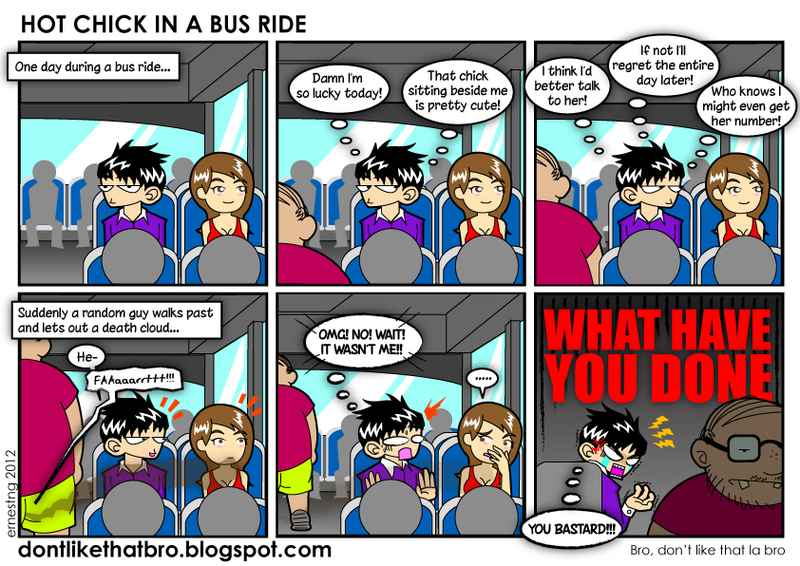 Seriously, how often does a bus ride damage your image? I have never taken a ride in the bus since. Not in my own country at least. Have a great day ahead everyone! if you don't take buses, then you'll have less chance of meeting cute pretty girl sitting next to you.. >_<"
hahaha that's just too bad.. there were a couple of bus rides i managed to hit a chick last time hahaha! cannot la compare our buses with public toilet. It's more like a jackpot. If you get a hit then you'd get a chick sitting next to you. If not then a person that'll make u curse your luck that day hahaha. my case is sad case. did u get the girl's number though? i rarely get on buses, but i remember a friend's experience on a bus: a sane-looking, old guy who sat opposite her, set his "lil' bro" for a breather. she had to pretend to look somewhere else until the guy got off the bus. then, a lady sat on the seat and my friend was like "eeeeeeeeewwwwww~"
well you should be the hero.. advise the guy not to fart and be more polite..
who know what the girl will reward you? the guy could have actually help you..
@simple person: haha guess i should have done just that... what a waste!! hahaha...i dont like public transport also..tp skrg pi keje naik lrt (=.=)"
i know kan? leceh dan packed macam sardin.. =_="
haha, no wonder u said our public transportation is comparable to toilet! yes! the smell! thats why its like toilet. Can't remember when was the last time I took the bus. I wont use bus in KL anymore. Better merempit than pack like sardine!